BBQ brisket at the GnarBQ. Sydney claims this is the best photo she's ever taken. If there's one thing that truly excites my taste buds, it's some really tasty BBQ, especially when paired with delicious local craft beer. Now combine those with a day-long event at one of my favorite local craft breweries Gnarly Barley, and you've got yourself a pretty perfect day. That about sums up my experience a few weeks ago at the second annual GnarBQ over at Gnarly Barley's brewery in Hammond, Louisiana, with Team Bite and Booze. This being my first official event as a team member, I was a little nervous. What if I embarrassed Jay and the team? What if I dropped a big tray of ribs covered in Jay's fantastic Jay D's Louisiana BBQ Sauce all over brewery owners Cari and Zac Caramonta? These and many more horrible scenarios played through my head the night before the event, but I was determined to shake those bad vibes off and get a good night's sleep so I would be on my best game for the following morning. I convinced myself before I drifted off to dreams of tender brisket and waterfalls of baked beans that the following day would go off without a hitch. I awake Saturday morning to the sound of my iPhone alerting me of a group text. The night before, Jay had prepped the smoker for brisket, and the trailer the pit was on caught fire. 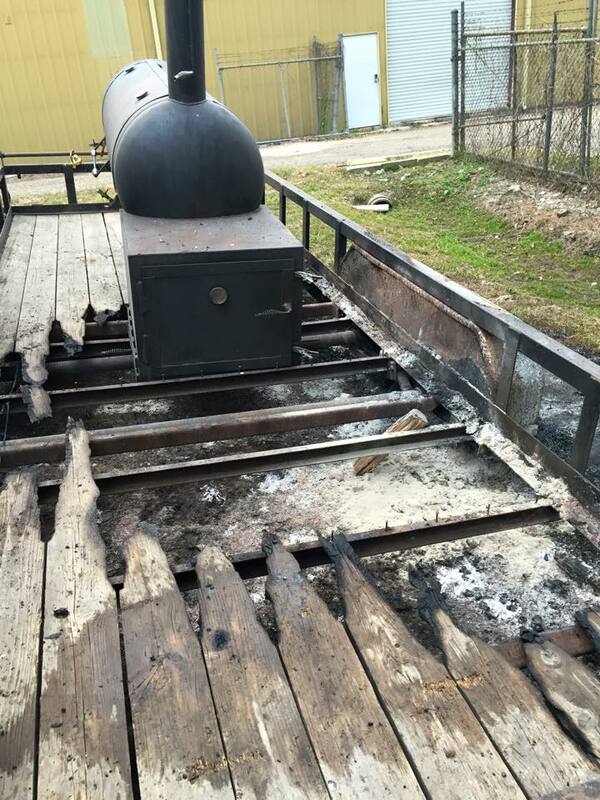 When he returned to check on the brisket around 4 am, he witnessed the dying moments of what had to have been a pretty raging blaze considering it had melted the tired off the trailer we had borrowed from Galen. Jay, Blair, and I getting some deliciousness into hotel pans for serving. I arrived on the scene later that morning, and once the rest of the team arrived, we began prepping the rest of the meats (chicken legs and ribs to go along with the brisket), cutting up cabbage for our slaw and getting the barbecue baked beans going. And of course, grabbing a cold Gnarly Barley brew. My first of the morning was a Radical Rye P.A., my favorite of their three flagships. It's got a nice bit of spice from the rye and includes two of my favorite hops, Magnum and Cascade. It's totally my go-to if it's on tap anywhere. The Radical Rye P.A. is my favorite of Gnarly Barley's flagship brews. As noon quickly approached we noticed people beginning to file into the brewery. They've got a thirst for cold brews in their eyes and a rumbling in their bellies for some hot BBQ that echoes throughout the building. As the line begins to form for food, the smooth tones of Will Vance & The Kinfolk begin traveling through the air, distracting the crowd with some tunes as we start setting up our assembly line of awesomeness. The food moves pretty quickly as we do our best to keep up with the hungry masses. After a while we run out of the first wave of food and ask everyone who didn't get a plate to please wait patiently while the next batch is cooking. Luckily, there's plenty of beer on hand to keep them satisfied until the next wave hits. While we wait on food, we all get a chance to try the specialty beer that's being featured that day, The Imperial Korova Milk Porter. This new twist on their existing Korova is a fantastic blend of chocolate and coffee notes with a bit of alcohol on the finish. Coming in at 9% the Imperial Korova is definitely something you want to sit and enjoy, not chug. I really enjoyed Gnarly Barley's Imperial Korova Milk Porter, their new twist on their existing Korova. Gnarly Barley packaged a very limited amount (1,000 to be exact) in 25oz bottles! This will perfectly age the beer so you can grab a few bottles to cellar for later. After a brief break we're back at it with our last round of food. The line formed quickly, and after a few minutes the remaining group of people who missed out on the first batch have been happily fed. Zac, Jay, and Cari pose for a photo at the brewery in Hammond, La. For my first official event with Jay and everyone on Team Bite and Booze I have to say that for me, it was a complete success. I can't wait to take on the next one with this amazing group of people. And hopefully next time we'll keep the fire contained to the pit.